Known as the "go to" pianist by many other musicians and band leaders, Lafayette has performed with the Duke Ellington Legacy Orchestra, toured for seven years with Max Roach, currently tours Europe and the U.S. with four time Grammy nominee-Ernestine Anderson and has worked with Al Grey, John Gordon, Slide Hampton, Curtis Fuller, Roswell Rudd, Chico Freeman, Cindy Blackman, Allan Harris, Carla Cook, Ren Marie and many others. Lafayette has worked in well-established downtown clubs like the Blue Note, Sweet Basil, and Fat Tuesday's, since his arrival as a young musician in 1985. He earned a reputation that led to a record deal with Muse Records, resulting in his debut album, aptly titled Lafayette Is Here. 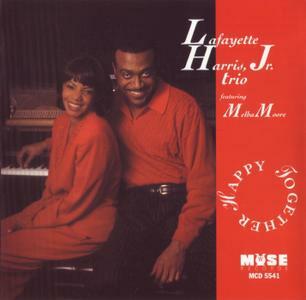 A second Muse recording, Happy Together, starred The Lafayette Harris Trio plus Melba Moore. в„—&В© 1996 Muse Records, a division of Blanchris, Inc.